One of our favorite pop stars was on The Tonight Show With Jimmy Fallon last night for the entire hour. 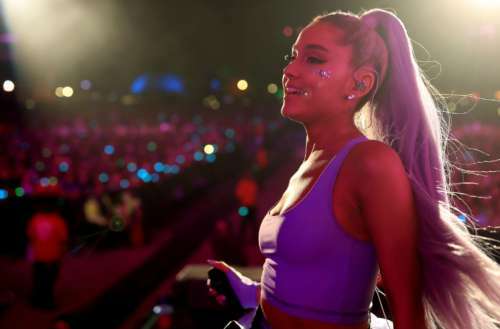 She revealed the name of the new Ariana Grande album — Sweetener — surprised fans and did another pitch perfect celebrity impression that left us gagging. She also revealed she will be doing something special on the 20th of every month until the album release. Her next important event is performing at the Billboard Music Awards on May 20. During another segment on the episode, Grande surprised fans who thought they were invited by Fallon to create a fan compilation of her song “One Last Time.” Grande and Fallon jumped out from behind a curtain to surprise the young aspiring singers. One dropped to his knees, and Grande complimented another’s use of different melodies than her own song. Another moment that we loved from Grande’s Tonight Show takeover was her celebrity impression. Grande is known for being able to manipulate her voice to sound just like other stars, especially Celine Dion. Well, last night Fallon asked her to do her impersonation of Jennifer Coolidge from Legally Blonde, and she sounded just like her! Grande closed the show with a performance of her new single “No Tears Left To Cry” for the first time ever on television. What do you think of the new Ariana Grande album name Sweetener? Sound off in the comments below and on Facebook.